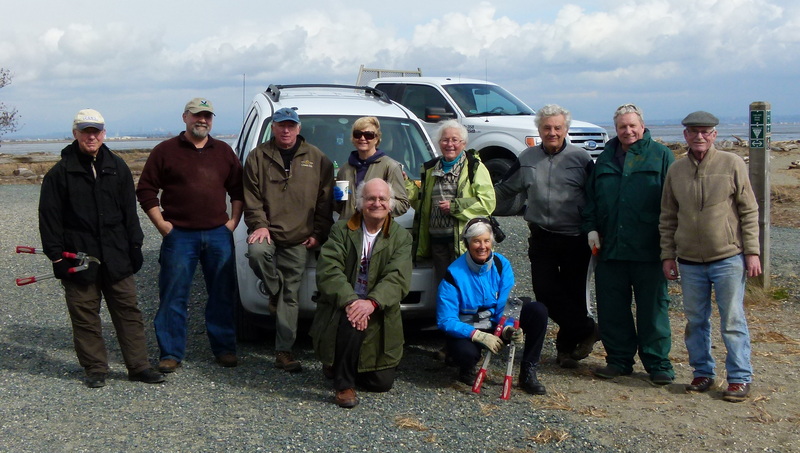 We had such an enjoyable morning today at Boundary Bay Regional Park (BBRP), that I thought a brief report might be interesting for our Delta Nats members (please circ Jimmy). Metro Vancouver Parks approached the Cammidge House Committee (CHC) and, by extension, the Delta Naturalists’ Society (DNS) to help with the removal of Scotch Broom, an invasive species, in BBRP. Of course, we were “gung ho” about this project, and MV’s Markus Merkens arranged for it to happen on March 22. We had 10 Nats (some are also on the CHC) participate with Markus, and Tyler who collected several truck loads that we had cut. The Nats Volunteers were (they like their names in print): Roger M, Anne M, Don F, Jean H, Donna T, Gerhard L, Hans-Ulf, Ursula, Terry McC and me. The sun was shining and it was quite pleasant, when working. We had a Smoko (Aussie for Break, no one smokes) at about 11:30 a.m. when MV’s Wendy Warn brought the coffee and cookies. In usual MV Parks style, it was fine dining at its best as we grabbed the store-bought and almost fresh goodies off the hood of the truck and washed them down with coffee or tea from a wooden box perched on the headlight. It was cool standing around, so we continued down the path cutting the Broom with the almost-functional saws and other tools provided by MV. Despite the inferior equipment, we put a helluva dent in the Broom in BBRP; I think MV was very pleased, and so were we. Interestingly, lots of walkers and runners stopped to enquire and thank us. And Ursula, Roger and others took some photos which hopefully we will see shortly on our DNCB Picasa http://picasaweb.google.com/dncbirding and/or our DNCB Blog at: www.dncb.wordpress.com. We finished and left Cammidge House around 1:00 p.m. feeling good. P.S. For Markus, Tyler & Wendy: The MV Jibes are solely for literary effect. Don’t get your shirts in a knot. This entry was posted in *DNS, BBRP, Cammidge House, Scotch Broom Removal. Bookmark the permalink.